Krishna Janmashtami ~ कृष्ण जन्माष्टमी also known as 'Krishnasthami' , 'Gokulashtami' or 'Ashtami Rohini' is a is observed on the eighth day of the dark half of the month of Hindu festival celebrating the birth of Lord Krishna, the eighth avatar (incarnation) of Lord Vishnu. 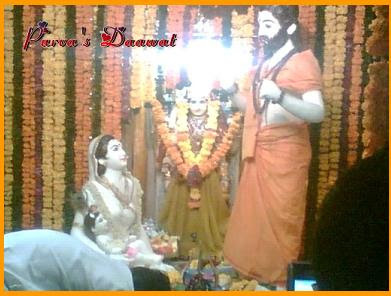 JanmashtamiShraavan. Lord Krishna was born to the proud parents Devaki and Vasudeva. It was none other than Devaki's own brother Kans who imprisoned Lord Krishna's parents at the time of his birth because it was predicted that the eight child of Devaki and Vasudeva would kill Kans.Krishna was born, there was severe storm and somehow Vasudeva managed to take Lord Krishna to Gokul, to give him under the care of Yashodha and Nand. The actual festivities begin during midnight in this 48 hour period. The celebration reaches its peak at midnight, with the birth of Lord Krishna, with lot of hymns, arti taking place and blowing of the Conch (shankh), rocking the cradle of Lord. The idol of lord is bathed with Panchamrit (A mixture of milk, ghee, oil, honey and Gangajal). The Panchamrit is later distributed as Prasad to the devotees along with other sweets. While some Fast on the first day and break it at midnight for others the fasting continues for both days. The period coincides with rainy season. Dahi Handi is celebrated with fervor, especially in Mumbai. Dahi Handi generally takes place on the second day of Janmashtami. An earthen pot containing a mixture of milk, fruits is hung high in the air with the help of a rope. Award money are hung along with the rope, which are later distributed as prize to the winners. 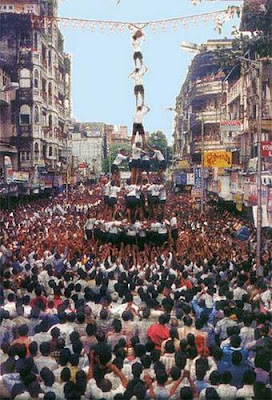 Enthusiastic young men known as 'Govindas' form a human pyramid by standing one on top of the other, trying to break the pot. Onlookers throw water on the young men in order to prevent them from breaking the pot. Breaking of the pot is followed by prize distribution. Lately there are even lady Govindas, who break the Dahi Handis. Many such Govindas compete with each other, especially for the handis that dole out hefty rewards. They yell ' Govinda Ala Re' when they break the handi. In Mumbai in Sanyashashram, a Temple in Vile Parle they make big Idols of GOD from Pure ghee, Last year they had shown how Lord Shiva comes to see the Eighth Avataar of Lord Vishnu in form of Lord Krishna and he takes the form of a sadhu (holy saint). Luckily I had clicked photographs of these Idols made of Pure Ghee, last year. 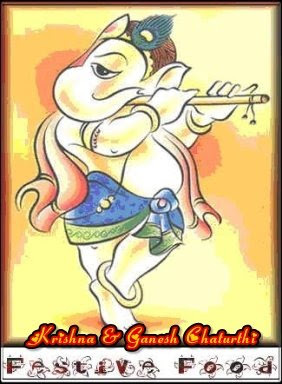 This year I thought will prepare Kheer for makhan chor, Kheer or Payassam being Rice pudding made from full fat milk, flavoured with cardamom and saffron thought will be good entry for Krishna ~ Ganesh Chaturthi Event. 1. Wash and soak rice for 20 minutes. Drain the water and mix the rice with ghee and keep it aside. 2. Boil milk and rice. Stir the milk and rice continously and bring it to boil. When the rice is boiled and rice is reduced to 1/4th amount, add sugar and mix well. 3. Add cardamom, nutmeg powder and chopped dry fruits. Add saffron strands in hot milk and then add it to the boiling milk. 4. Boil the milk till is almost reduced and kheer becomes thick. Since Kheer is a close version of Payassam, here's my entry for Anisheetu's SWC - Karnataka event. Nice entry for the event yaar...gud..Kheer looking yummy...I'll post my entry soon too..
love this kheer..made it last saturday for a function..
Pot full of kheer! Lovely pic taken in the temple. Would have loved to participate in your event..But I had not made anything sweet with milk except for the Panchamrut. lovely pot n the payasam is lovely too ..
Lovely and tasty kheer....I made this last saturday only for janmasthami. The kheer looks heavely in the vessel. Good presentation. I miss them so muuuch ! 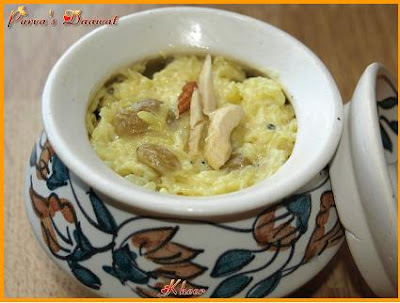 Great entry for the event, kheer look mouth-drooling!!! Purva your kheer looks so yummy. Thnanks for dropping into my blog. Hope to get some recipes from you for my blog event. Beautiful entry for the event girl! Those idols were made of butter! How did they do it... wont it melt in the heat. Some talent huh! Looks beautiful! I often make this with soy or rice milk. Looks very authentic and Yumm Purva..I will send my entry to Ganesh chaturthi soon..Thanks for hosting this event..
Kheer looks delicioys.. I love your pot..
Nice entry. I remember going to Sanyasashram in Vileparle. Have passed you an award, please collect it from my blog.